Tom Balcom, Founder of IBIS Wealth Management and Winner of the Structured Products Association’s LeadingEdge Advisor Award, was interviewed today by StructuredRetailProducts.com. We have posted below the article that was just published for our clients review, as StructuredRetailProducts.com’s website and magazine is strictly subscription-based. 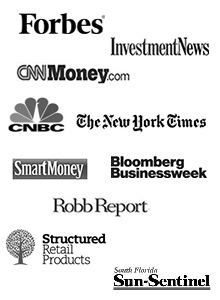 If you have any questions related to the use of Structured Products within your investment portfolio, or if you would like to set-up a complimentary investment portfolio consultation to discuss your current investment strategy, please contact Tom Balcom at 1-800-658-9560 or tombalcom@ibiswealth.com. Thomas Balcom, founder of IBIS Wealth Management in Boca Raton, Florida, is a hero of sorts to his clients. That is because a two-year structured note linked to a real estate exchange traded fund (ETF) that matured last week has returned 180% of initial capital to investors. The note was customised for Balcom’s clients in early November 2008, at the height of the financial crisis and less than two months after Lehman Brothers filed for bankruptcy in mid-September 2008. “We were looking to recoup some of the losses that had been incurred during the financial crisis, while still offering our clients a level of downside protection,” Balcom told SRP. Despite the US subprime real estate market meltdown, Balcom said that being a devout asset allocator meant that turning his back on the real estate market was never an option. “There was never a discussion about abandoning the asset class. Rather, the focus was on whether or not mutual funds, ETFs or structured notes offered our clients the best risk/return parameters,” he said. Deutsche Bank structured and issued the original note, which was linked to the performance of the iShares Dow Jones US Real Estate Index Fund, an ETF. That structured note struck its price on 6 November 2008, offering a 200% participation rate, a cap on index growth of 40% and an all-important 20% downside buffer level. Balcom, along with other financial planners at Balcom’s previous firm, invested just shy of $7m in the note allocated across the firm’s clients. According to Balcom’s calculations, the note outperformed the benchmark index by 26.40%. That buffer was what kept many of Balcom’s nervous clients focused, especially when equity markets swooned to very low levels in March 2009. Balcom said that most of his clients are in their 50s and 60s and are cautious. While some were just too shaken and sold out of all of their holdings, other clients just sold their long-only mutual funds and ETFs but remained invested in the structured note. “Clients are okay with [sacrificing] a bit on the upside for the downside protection,” Balcom said.